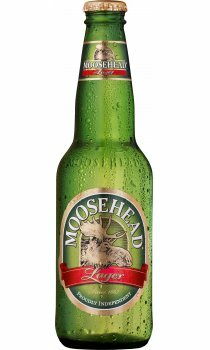 Moosehead lager is a golden lager that is light in body and highly refreshing. Offering a fine balance between malt sweetness and hop bitterness. Made from an age-old yeast culture. Moosehead lager is brewed longer to impart its unique flavour. You can find Moosehead fairly easy in the states, but else where it is a bit difficult. Very good find and buy here since I've been in the UK for the past 5 years. If your looking for a great tasting lager outside of Europe - you won't go wrong with this beauty. Discovered this when I was 18 & thanks to the web I discovered that I could buy it here at the age of 40 :-) Oh happy days.